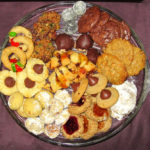 In March of 2010, I wrote a post called How Did Bubbe Bake It – Part 1, exploring a sketchy recipe I had written down capturing how my maternal grandmother baked a Jewish 3-sided cookie called a hamantaschen. In the post, I promised to write Part 2, exploring my grandmother’s undocumented recipe for a Jewish yeast bread called challah. After attending BlogHerFood in San Francisco last weekend, I’ve decided to go backwards and write a prequel to that post, instead of part 2. I figure if it was a good enough strategy for George Lucas and Star Wars, maybe it’s an acceptable approach for me too. Here’s why I’m starting at the beginning. I had a breakthrough at BlogHerFood during their Culinary Ambassador’s session. For some of you reading this post that are literate and well-versed in American history, my personal enlightenment may seem trivial and obvious, but for me it was an epiphany. My mother is one of six children in her family and not one of the six (4 girls, 2 boys) learned my grandmother’s fabulous baking skills or have a single recipe of hers written down. But my mother will tell you, at every opportunity, how food was the gathering point for her extended family and that despite the tiny size of their apartment, it was there that everyone gathered to socialize. Why? Because my grandmother’s baked creations (and savory) were impossibly delectable. So whether it was to break the fast after Yom Kippur or celebrate the New Year or mourn the loss of a relative, it was at their very humble abode in Brooklyn that everyone gathered. 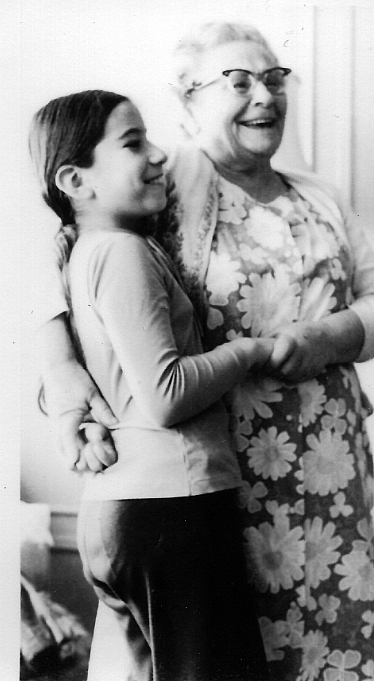 And even years later, after I was born and we would visit her in her even tinier apartment in Brooklyn, she would still have fresh, hot challah waiting for us when we arrived on Friday night. She continued baking, despite her very poor eyesight and incredibly small kitchen, until she was over 90 years old. So I’ve always wondered: if food was so special and central to their family, how could a whole generation exclude themselves from learning to cook it? I found the answer during BlogHerFood’s session called Food Diplomats and Cuisine Ambassadors with Elaine Wu (Virgo Blue and BlogHer.com), Donna Pierce (BlackAmericaCooks.com), Laura Beck (Vegansaurus.com), and Srivalli Jetti (Cooking 4AllSeasons). The big “aha” moment was when I asked the panel why my grandmother’s food traditions skipped a generation, explaining that my mother was born in 1929, the start of the depression. Donna Pierce immediately answered, explaining that my mother was a young housewife in the 50’s, the era when fast and pre-packaged foods were introduced. In the 50’s, women were encouraged to spend less time in the kitchen by using simple, prepared foods that were quick to the table and easy to clean up. My grandma’s challah did not fit that description. So why would a housewife make her own soup, if she could buy it in a can cost-effectively (remember these were depression babies) and why slave over kneading fresh bread dough if Wonder Bread is available? (Wonder started selling pre-sliced, pre-packaged bread in 1930, smack dab in the middle of the depression.) And of course, why prepare a 3-course meal, when she could heat up a frozen dinner with a main course, vegetable, starch, and even dessert, all in one plate. I even remember in the late 60’s, the big family treat was eating a frozen dinner in front of the TV on a TV tray watching Wizard of OZ when it was broadcast once a year. Nothing wrong with the Wizard of Oz part, but what’s up with the frozen dinner? The good news is that while all these nasty, processed, prepared foods were being introduced to the mass market, some revolutionary food icons were coming on the scene to help counteract this trend. For example, in 1951, Julia Child opened up her cooking school L’Ecole des Tres Gourmandes with Louisette Bertholle and Simone Beck, in 1955 Thomas Keller and Michael Pollan were born, and in 1956 Bon Appetit magazine was introduced. So while still today we continue to fight the strong influence of unhealthy, processed, prepared foods on the American diet (thanks EatingRules for taking on the processed issue), we also have this growing group of food bloggers as well as many other food icons that are espousing a myriad of alternative forms of eating that involve healthy, unprocessed, approachable methods of lovingly putting food back on the American dinner table. And I am so happy that I had the chance to put this historical view into perspective and clarify to myself why I feel so compelled to carry on a tradition that I so fear might whither away. And it was BlogHerFood that provided me with the venue to explore this part of my family food history and even to meet an old friend who is interested in exploring just the same thing with her grandmother’s recipes as well. So a big thank you to BlogHer for gathering up such a great group of panelists, guest speakers, attendees, sponsors, and vendors to educate me and inspire me to pursue my passion to keep my Bubbe’s memory and traditions alive for my family, and many more generations of families to come. What an amazing post. My mom was born in 1923 and while we did eat those interesting Swanson’s TV dinners, she was more apt to save the tin “plate” and make her own TV dinners. For some reason, she ended up making more meals from scratch than joining too much of the fast-food and pre-packaged trend as I was growing up. I guess it could be the influence of the Army (we moved a lot and she gathered recipes everywhere we went). Who knows? I LOVED this post because it brought back so many memories. I’m off to dig thru some of my mom’s old cookbooks now. Thank you for the trip down memory lane! Oh gosh – I just love your comment! So glad to hear I’ve motivated you to pull out those old cookbooks – that makes my day – possibly even my whole week! Love the part about using the tins to make her own dinners – great stuff. Thanks for coming by! Keep those old cookbooks safe and well-used – they are so precious! What an awesome post! I learned something today! Thanks for the history lesson. I never even thought about the introduction of prepared foods influencing family tradition recipes! 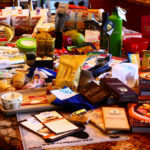 I hadn’t either until that session at BlogHerFood – truly an AHA moment for me! Some seriously good food for thought and I get the skipping a generation when it comes to cooking skills. I have to say, my Bampa could cook like there was no tomorrow but both of my parents were “box mix” cooks. So, it’s no surprise that when I started to cook, I cooked what I knew. However, over time, my skill-set grew and the less I utilized canned soup, etc. I will say that the more I learn about processed food and convenience, the less I want to have it in my house and cook from scratch. Yes, through blogging, I have learned so much about processed food and it’s negative affects and have become more inspired to cook from scratch, even if it’s just fried eggs and toast. There’s always something you can pull together right? A beautifully written post. I liked that you decided to do a prequel and this provides a rich history. Thank you for sharing. I was so excited when I figured out there might be some logic to why all 6 kids didn’t learn to bake that I just had to write about it. It was like getting a piece of the puzzle to fit. I have to tell you- cannot get bubbe out of my head all day! Such a great name for Grandma…making me think of mine all day. Isn’t though? Goes so well with the matzo meal pancake she always used to make for me called a bubula! Glad it made you think of your Grandma – what could be better! Thanks for the virtual visit all the way from Toronto! Wow, that was really insightful and makes total sense…Glad you are picking up where your Bubbe left off. I have a long way to go and boy do I wish I had all of her recipes! But I realize that the more I bake, the easier it gets and I love thinking of her! Love the bit of history implemented into this post….LOVE Challah french toast! Goodness, that photo is priceless. Very interesting ideas, a little sad for the young women who missed out but nice that things have swung back the other way a bit. I make everything from scratch (including our bread), so convenience for me is quickly finding a recipe on a great food blog or cooking from a recipe on the iPad that hangs in my kitchen. Best of all worlds! 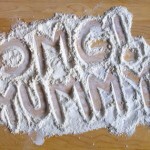 Wow – so nice to meet someone so committed to making food from scratch. I’m still fighting my convenience demons but at least recognize healthy choices from processed, unhealthy ones. It can be scary at the grocery store sometimes just watching what goes into some carts! Isn’t great to have technology to help us now? Instant answers, techniques, and creativity! Hi! I came here from your comment at Casual Kitchen. I never knew one of my grandmothers and remember very little about the other and cooking/food. The only thing I remember is that her kitchen was very tiny, had absolutely no counter space — the kitchen table served that purpose. Also, she loved Tang! Over the last 10 years or so I’ve been teaching my daughters about the necessity of cooking and eating real food. Even a simple meal of real food is preferable to a diet of convenience food. Their grandfather (my former father-in-law) died earlier this year. They were shocked to learn that their grandmother has started eating nothing but frozen meals. So, their Christmas gift to her this year is a supply of homemade frozen meals. They’re both making several meals (that make 3-4 servings each), portioning them and freezing them for her. With the exception of fresh vegetables or fruit, there will be nothing to add. I was pleased to realize that they got the message and even more pleased that they’re doing that for their grandmother. What an interesting story! I am so glad to hear that your children realize the importance of home-made food and are doing such a wonderful thing for their grandmother. Interesting about you eating out in the 50s and 60s – sounds like for very good reason. We actually eat out quite a bit – I am a firm believer in making life as simple as possible and if that means a meal out or even “semi-homemade” sometimes, then so be it. Sanity above all else. But to learn to prepare and enjoy homemade food is like no other experience, I think. Especially the food that is handed down from generation to generation. It’s the memories and stories that go with the food and the meals that are the best of all. What a wonderful picture of you and your Bubbe! And you know, it is not unheard of for skip-generational appreciation. Very often children don’t appreciate what our parents have done in their lives and disregard the things they do as “old-fashioned” and/or “unnecessary.” Well, that is, until they are gone. Then it is too late to hear all the good stories. For some reason, though, the previous generation is fascinating to us, maybe because they are so different (we think) from our own parents. I’m glad you had the chance to bake with your Bubbe and look forward to hearing about the challah. Beth, what a moving post! Thank you for writing on this. I am so glad that you participated our panel and made us think so much on different aspects..:).. Excellent post! At my house we often discuss where and when our food habits went wrong – you’ve definitely hit the nail on the head. Convenience foods have nearly killed us, but we seem to be slowly emerging from that unhealthy trend and are getting back to homemade good-for-you foods at last. Thanks for sharing with us. I look forward to reading more of your posts! This is beautiful, and it’s exactly why I started my blog project. I can’t wait to read more about your Bubbe. My nana died before I was born, so I got most of what I could from her by talking with my mom. It’s enriched my life beyond measure. Very interesting. I guess those trends did change quite a few things women did. I recently picked up some 50’s era cookbooks and this is so true. You gotta love a good aha moment. Cheers to bringing back food the way grandma, and great grandma, used to make it. I would love to check out those cookbooks! I do have a couple of super old ones my mom gave me that were so tattered I had to put them in a zippie bag just to keep them all together. Will have to pull them out and see just what year they are from. Wonderful observations about why you want to connect with your grandmother’s cooking and you mother’s generation did not–and good luck in your efforts! Another thing to consider, at least when it comes to baking, is that baking is sometimes a mindset issue. I remember during culinary school my chefs knew I was a *baker* more than a *cook* as I was always asking what temperature, how much and for how long when they’d rattle off a mixture to me. While I learned ways of coping with the hot line frenzy, I am definitely more of a baker, a food chemist, than a dash and pinch sort of cook. That said, you can improvise a lot on baking *once you really understand your ingredients and how they interact*–some people have a feel for it, others never get the knack. And society plays as much a part in that as genetics and general aptitude. I agree that some of us are more bakers than cooks and vice versa and some of us neither :-). I definitely gravitate towards cooking and honestly my aunts and mom were all good cooks. So your point is definitely important. But if my mom did bake like my grandmother did, I just can’t imagine not learning the technique and recipes. Also, despite my great fear of baking, I know the only thing holding me back is practice which requires time which I am very short of these days. I will check out your Nibbles ‘n Bites food blog. Love the name — can’t wait to take a look. Stopping by from SITS — saw you commentluv link and had to visit! The BlogHer event in SF sounds fabulous! I’m just 2 hours South. Geez, I really need to get on board with BlogHer! I was just in LA this past weekend. Every time I go there I can’t leave without visiting Canter’s Deli. Their bakery case is mind-blowing. I love their Hamentachen! You could nearly wear their hat-shaped cookies as an actual hat, they’re so big (and tasty too!). My favorite though, is the Rugulach! Have you tried the Cook’s Illustrated (America’s Test Kitchen) recipe for Challah? I love it and it reminds me of my grandma’s! Hi again Jenn! I will definitely check out the Cook’s Illustrated recipe and see how it compares to my hand-scrawled no-real-measurements Grandma version as well as a couple of others I’ve tried. Need to whittle it down until I find the right mix. 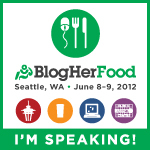 BlogHer’s main conference will be in San Diego next year in August and I don’t know yet where the Food one will be. But definitely worth checking out. I was impressed. As for Canter’s Deli and their rugelach – we make a mean rugelach in this house – look for a post about that in the Dec/Jan time frame. And yes, their bakery is amazing. Lovely post! I went through a food museum display in rural Illinois recently, and they talked about the shift in food during the Depression. My family, too, was impacted by this shift. My great grandfather owned a grocery store, and during the Depression chain grocery stores started to become popular. My great grandpa’s store was edged out of business by competing “big box” prices that he couldn’t match. They were probably selling those cake mixes you’re talking about in your story! Hurray for the new generation of foodies who appreciate where their food comes from, support local business, and make things from scratch. It’s beautiful! What an interesting point you bring up about the impact of the chain grocery stores on what we eat. I know in our part of the Bay Area, the smaller grocery stores are battling and not always winning trying to stay alive in competition against the big chains. I think more of us are willing to pay a little extra to get the quality and selection at specialized stores. But then again, the economy has made that choice unavailable for many. I think the good news is that I see more and more chains offering organic, gluten-free, and specialty gourmet items to serve their more discerning customers. Very thoughtful post. I was just discussing this subject with a woman I met on an airplane the other day. 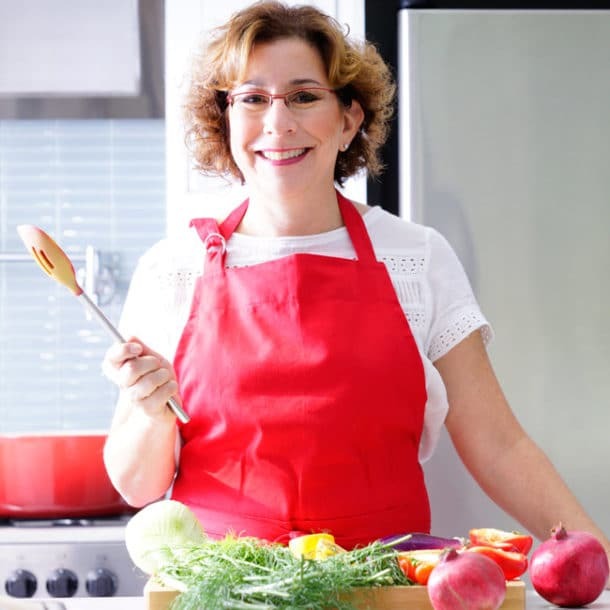 I encouraged her to encourage her daughter, an aspiring cookbook writer, to use her grandmothers’ Italian and Russian recipes as material for her first book. I would so want to read that cookbook – Italian and Russian. In my family we have Jewish heritage combined with Polish, Russian, and Korean/Hawaiian. I wish you could be a guest at my Bubbe’s table too – but I hope to figure out how to recreate that table myself, not just for the fabulous food, but for the warm memories it created. My mother was born not long before yours and, while she enjoyed trying out some of the hot new things of the 50’s like TV dinners and cake mix, they never “took” with her. She already had a love of cooking. Of her four children, only one (ME!) inherited an interest in cooking. Don’t know, but the same could be true in your family. As hard as it is for me to imagine, a lot of people just don’t like to cook or bake! (I don’t get it–what’s not to love?!) I’m glad you are determined to keep the family food traditions alive. That’s what I’m doing as well. Keep up the good work! In fairness to my mom and her 3 sisters, they did all cook (not much baking at all) and some of their savory dishes were pretty fantastic. But it just always amazed me that I never saw one of them do what my grandma did. Even when my grandma visited us in the summer, she worked on her own counter baking, and my mom was always doing something else. Probably also influenced by lifestyle – my mom had the always-driving suburban lifestyle while my grandma lived in the city and all was accessed by foot or public transit. Grandma never even learned to drive. Beth, on behalf of BlogHer and the panel, you’re most welcome. I’m touched to hear you were inspired by the conversation we were able to provide. I hope to see you at BH Food next year. Please be sure to introduce yourself next time. I definitely will look forward to meeting you. You are an inspiration to me that you’ve found a wonderful way to combine your love for food with your career in marketing and communications. And the panel you moderated really did have an impact on me and I know, several others I spoke to in the room as well. What a wonderful vein you’ve tapped! I love the personal aspect of it, of course, and it also is a fascinating sociological phenomenon in itself. Have you read the book “Something From The Oven” by Laura Shapiro? If not, hie thee to your local bookstore or Amazon or wherever you go – just GET IT! I guarantee you’ll love it. LOVE IT! Ack! The above is actually me, Anne, from Fab Frugal Food. I must have left myself signed in as my other blog identity, on a totally different topic! :O) Not that I mind people seeing it, but, ya know. Heh. So funny – I checked out your other site – if I was younger and planning to have more kids, I’d be most interested. We had a doula with us for both births. Thanks for the book suggestions. My list of books that I have to read, including cookbooks of course, is growing longer. These both sound wonderful – I’ll put them on my Amazon iPad must buy list. 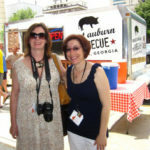 I look forward to enjoying our virtual conversations until we meet again at BlogHerFood 11! Me too – those little apple and cherry cobblers were the crown jewel at the end of what I now realize was nothing but costume jewelry 🙂 Looking forward to reading more of your blog Mele Cotte. I also loved your post, especially the reference to the Wizard of Oz once a year! I remember that, although I don’t think I had a TV dinner watching it (but I did eat them, both Swanson and Libby’s). My bubbe also was a great cook, but my grandmother did not enjoy it and only cooked because her family had to eat. As with your family, my bubbe’s recipes were lost. My mother tried to recreate her tzimmes, but never got it quite right. Back in those days, bubbe’s never wrote down recipes. It was a bissel of this, a pinch of that. . . I unfortunately never got the cooking gene either, but I do miss the foods of my childhood! Wendy – when I asked my grandmother to make challah while I watched and wrote down the “recipe”, it was exactly what you said in your comment: a bissel of this or “shitarayn” which means to pour in a bowl in yiddish and frequently got shortened to, well, you can guess what it got shortened to. So my “recipe” shows pictures of drinking glasses that she had on her shelves and poured things into with markings to show how high up the glass was filled. No digital cameras or digital video. Wasn’t even smart enough to measure the glasses so I could more accurately recreate the amounts. Forgot to mention I loved the picture of you and grandma. I don’t think it was frozen dinners for “Wizard of Oz”, though…. I would tend to believe it was either East Side pizza or Kraft Mac and Cheese….. I can’t belive Garry wrote East Side pizza out loud! Oh, my–we’ve been known to bring those pies home 1/2 way across the country!